The former employer of a reporter called to testify in the John Feit murder trial is objecting to his testimony, according to court documents filed last week. Feit, 85, is on trial for allegedly murdering schoolteacher Irene Garza in April 1960, when he served as a visiting priest. The Dallas Morning News submitted an objection to the prosecution’s Nov. 21 subpoena of Brooks Egerton, a former investigative reporter who currently resides in Tennessee and works as a freelance writer and editor and has written about sexual abuse in the Catholic Church. The judge presiding over the case has yet to issue a ruling on the objection. These witnesses are Rev. Joseph O’Brien, a now-deceased priest who worked with Feit at McAllen’s Sacred Heart Church — the location Garza was last seen alive — and Dale Tacheny, a former monk at a Missouri monastery where Feit was sent in 1963. O’Brien told Egerton he suspected Feit almost immediately after Garza was reported missing because Feit gave him conflicting explanations for scratches on his hand. Tacheny said Feit confessed to suffocating a woman with a plastic bag during a counseling session in the early 1960s. Feit’s defense team attempted to prevent Tacheny from being able to testify, but state District Judge Luis Singleterry ruled that Tacheny could be called to the witness stand, and the prosecution promised jurors on the first day of trial that they would hear from the former monk. Egerton also obtained McAllen police records from 1960 from a non-law enforcement source. 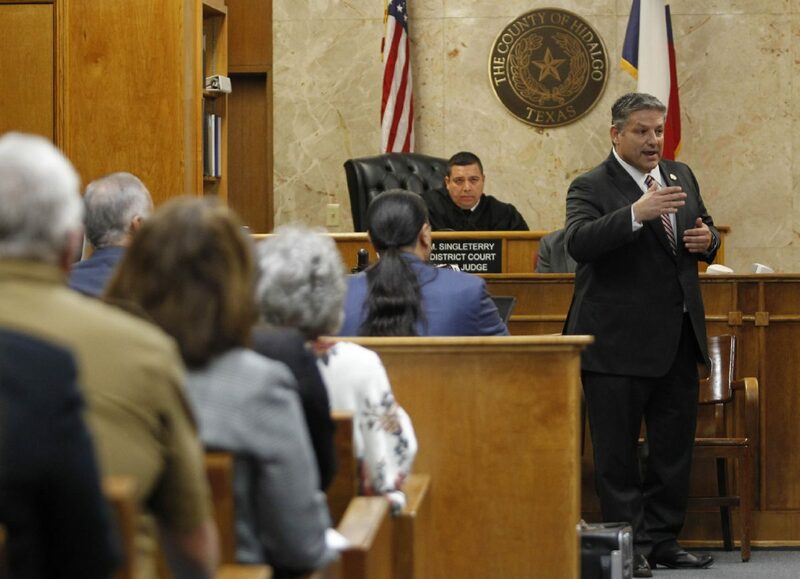 Information in the records contradicted statements former Hidalgo County District Attorney Rene Guerra made to Egerton during interviews about the cold case. Garza declined to comment for this story. Journalist testimony appears to be a crucial element of the state’s case. The trial began Thursday with testimony from former TV news reporter Darrell Davis who covered the Irene Garza case in the 1960s. He told jurors he was privy to an off-the-record conversation with then District Attorney Robert Lattimore who said authorities had reached a deal with the Catholic Church not to charge Feit’s with Garza’s death. The defense, on the other hand, has challenged the lack of physical evidence “affirmatively” linking Feit to Garza’s death. The third day of trial in the decades-old cold case begins Monday.